The submission table is useful for checking the status of submissions and feedback at any stage in the process. It can also be used for direct grading and uploading of feedback on an individual student basis. However, other batch methods are more likely to be used. The table can be sorted by any of the columns with red headings. It is also possible to hide a column using and to bring it back. If groups are in use, you can view by group. Status tells you whether a student has submitted anything yet. This is a useful column to sort on so you can group all submissions together. Grade will show any marks that have been given via the Grade / Quick Grading. It can also be used to upload feedback files etc. on an individual basis. However, there are other more likely ways to grade, see Provide Grades and feedback on individual student submissions. Edit dropdown offers various options: Update grade (as Grade above); Prevent submission changes prevent further changes by the student (prior to the due date); Grant extension allow student time to submit beyond the cut off/due date; Edit submission you can make changes to the submission on behalf of the student eg. upload a different file. Last modified (submission) is the date of the last update to that particular submission. File submissions links to all files submitted. It also shows the Originality score and links to the Turnitin report if applicable. Submission comments if used, enables students to leave comments to which markers can respond. Last modified grade: date the grade was added/changed. Feedback comments entered via Grade or uploaded in batch process. Annotate pdf feedback in form of annotations to a pdf submission will appear here. Feedback files added via: Grade or uploaded in batch process will appear here. Final Grade is the latest grade entered via Grade (or another marking method). Outcomes contains details of any outcomes applied to a submission. See Outcomes on Moodle Docs. If you scroll to the bottom of the table, you will find the Options section which provides several ways to organise the table for ease of marking. Control the number of assignments per page. 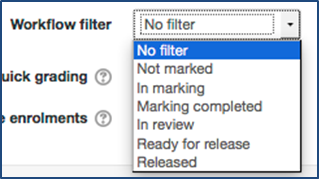 Filter submissions by Submitted, Not submitted or Requires grading. Filter submissions by workflow state (if applicable).